The Dow dropped more than 140 points Tuesday. One scary -- and false -- tweet, and the Dow quickly plunged 140 points, or roughly 1%. Many are pointing fingers at high speed trading by computers for the swift decline. The Dow quickly bounced back. The sharp sell-off highlights just how disruptive computer-driven high-frequency trading can be. The S&P 500 lost $121 billion of its value within minutes. High-speed computer trading accounts for roughly 50% of all trading. That's down slightly from a few years ago, but traders on the ground say it feels more dominant. And mini flash crashes have become an all too familiar daily occurrence. "This shows the Achilles' heel of a market structure that has high-frequency trading as its backbone," said Sal Arnuk, co-head of trading at Themis Trading. Traders and analysts say that at the first sign of crisis (and sometimes in the absence of a crisis), high-frequency traders pull out of the market, leaving a void of buyers and sellers. In fact, liquidity dried up even faster after the false tweet Tuesday than it had during the infamous Flash Crash of 2010. Eric Hunsader, the founder of Nanex, a firm that tracks trading behavior. said Tuesday's market reaction shows that trading has become even faster in recent years. "One tweet can do more damage to our market's liquidity than the flash crash," said Hunsader. Certain trading pools were overloaded, and trades weren't reported for four minutes, he added. Within the past year and a half, disruptions in the market marred the IPOs of the BATS exchange and Facebook. 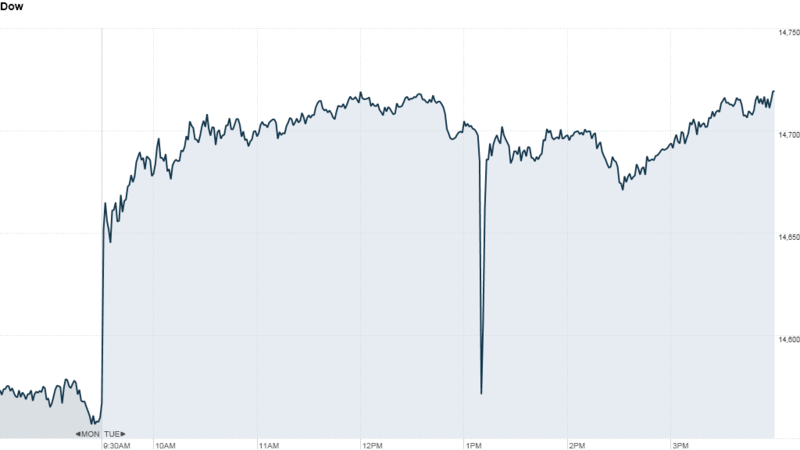 Just Monday, Google (GOOG) had an inexplicable flash crash. It only lasted a few seconds but still signals the fragility of markets in a high-speed trading world. The SEC, Nasdaq and NYSE all declined to comment on Tuesday's flash crash. A spokesperson for BATS called the drop a "non-issue for the trading community" and said the exchange had not received any calls from customers.